Despite a continued effort among many nations to crack down on drug trafficking, the misuse of illicit drugs continues at an alarming rate. This is especially true of opioids. According to the CDC, the U.S. saw a 137% increase in drug overdose-related deaths between 2000 and 2014. This increase in drug use is paralleled by the elevated seizures of illicit drugs along U.S. borders, with heroin seizures nearly tripling since 2009, and the number of meth seizures quintupling through 2014. With crackdowns by border patrol and government agencies and efforts being made to lock down borders (such as the proposed border wall between Mexico and the U.S.), those involved in the drug trade continue to explore other, more dangerous methods of smuggling. This has led to an increase in the utilization of people as drug mules, which includes the dangerous act of swallowing packages filled with drugs (body packers), along with using traditional travel means (boats, airplanes, etc.) to cross borders. In one recent case, a child as young as 11 was hospitalized after one capsule of cocaine (of more than 100) ruptured in her stomach. In this report, we’ll share data showing common points of drug entry, arrests, and how the illicit drug trade has impacted the U.S. 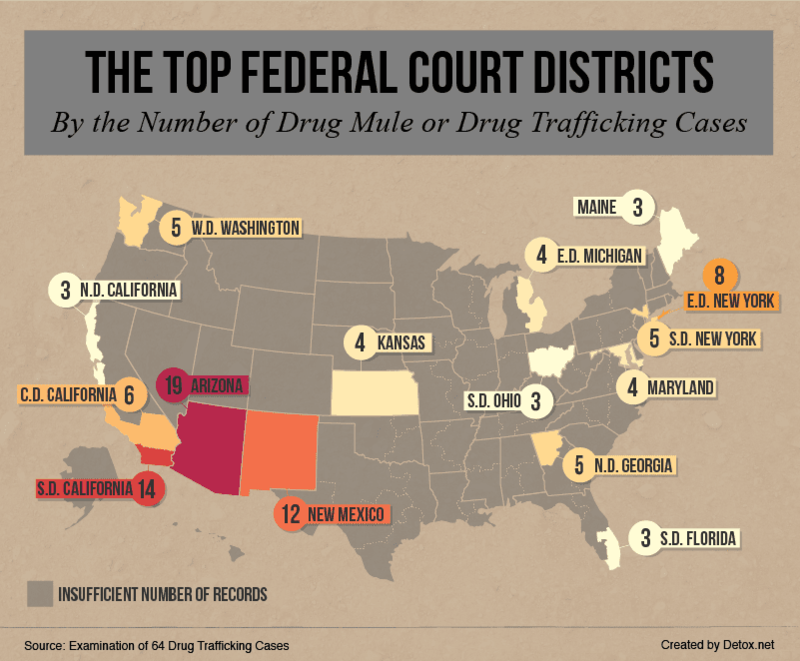 The data were gathered from over 150 court cases related to drug mules or drug trafficking charges. When looking at the visualized data, the largest number of seizures occurs along the southern U.S. border. 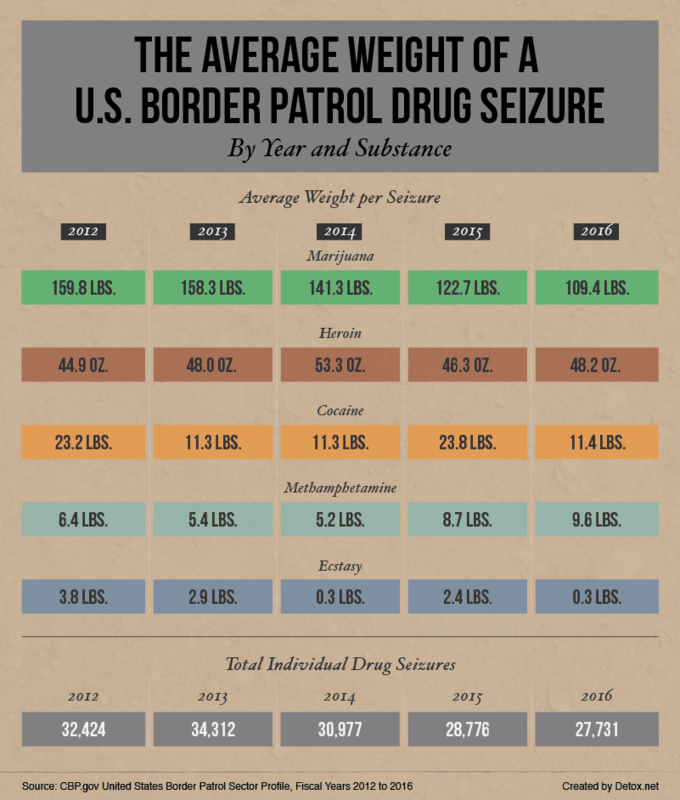 According to the U.S. Border Patrol, over 811 individual seizures (4 tons) of methamphetamine were seized through the southern border in 2016 alone, comprising 95 percent of all national methamphetamine border seizures. 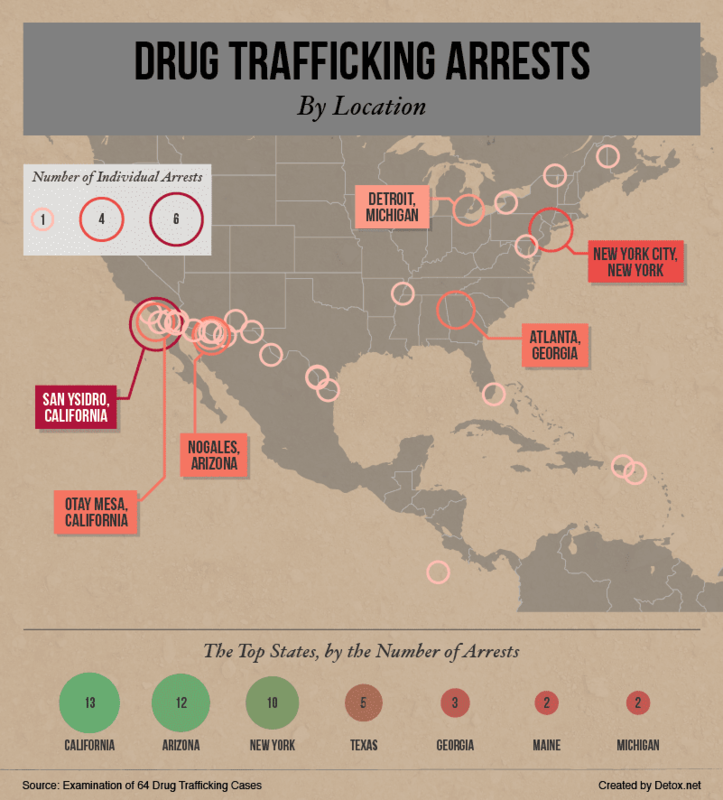 Based on the data, San Ysidro sits at the top of arrest records for drug trafficking. This makes sense, given it is the “busiest land port of entry in the Western Hemisphere.” This doesn’t mean the Mexico border sees the bulk of the drug trafficking arrests, though. 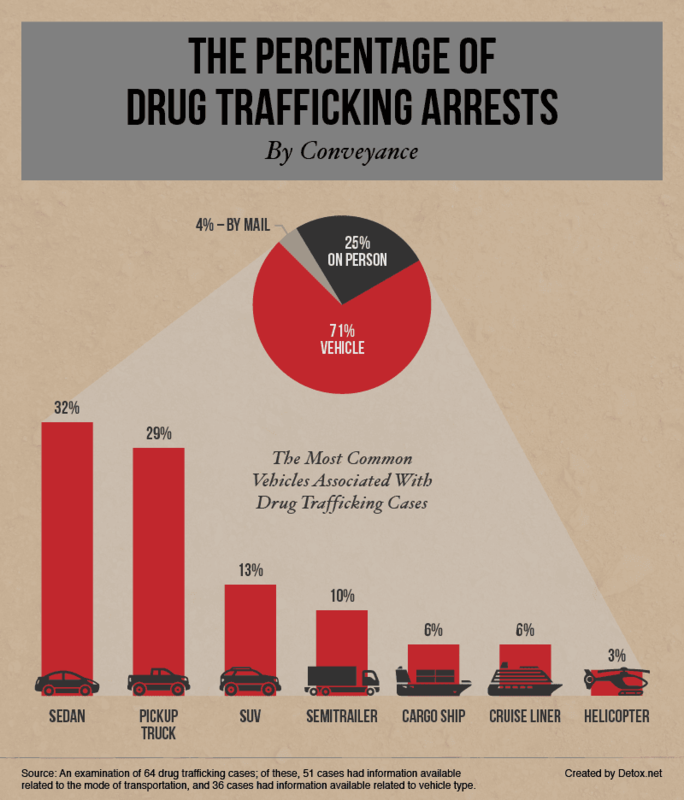 A high volume of trafficking has been found in other major cities including Atlanta, Detroit, and New York City. Based on public records, a large volume of seizures is related to drugs being trafficked not only through major airports, but also through U.S. mail and other carriers. In 2015, federal auditors seized nearly 35,000 lbs of marijuana from USPS parcels. While the data show states along the southern border see the highest volume of drug trafficking-related cases – with Arizona, New Mexico, and California seeing the most incidents – a review of the federal court districts and cases tried for drug trafficking show the problem isn’t at all isolated to the southern border. Additional data, including information pulled from court documents, show cartels continue to use coastal states as secondary channels for trafficking drugs including marijuana and cocaine. Arizona remains one of the states with the heaviest incidents of drug trafficking despite the fact that the U.S. Department of Justice identified the state as a “high intensity drug trafficking area” in 2010, and strategic developments for intervention have subsequently been implemented. The state’s shared border with Mexico is a likely culprit in its persisting problem with the drug trafficking trade. The U.S. Department of Homeland Security has found sophisticated tunnel networks that stretch between Mexico and Southern states like California. The cartels don’t always opt for sophisticated stealth, though. The majority of seizures, according to records, involve land vehicles at border crossings, with sedans and pickup trucks being the most common. That still leaves the sea and air, which the U.S. Coast Guard patrols heavily for drugs trafficked via cruise ships, cargo vessels, aircraft, and even semi-submersibles reminiscent of miniature submarines. Arguably, the most dangerous and potentially lethal method of transporting illicit drugs into the U.S. is through the use of drug mules and body packing. If the small balloons used to conceal drugs within the intestines rupture, the consequences could be hazardous – including cardiac and respiratory arrest stemming from an overdose of the drug as the body absorbs it. Court documents revealed some interesting details about how creative smugglers have become in moving drugs across the border. In over 60 vehicle-related drug seizures, we were able to compile information on how illicit substances were hidden to avoid detection. In some cases, drugs were stashed in multiple locations throughout the vehicle. Some of the most common places included drugs being hidden in the gas tank and inside the seats of the vehicle. 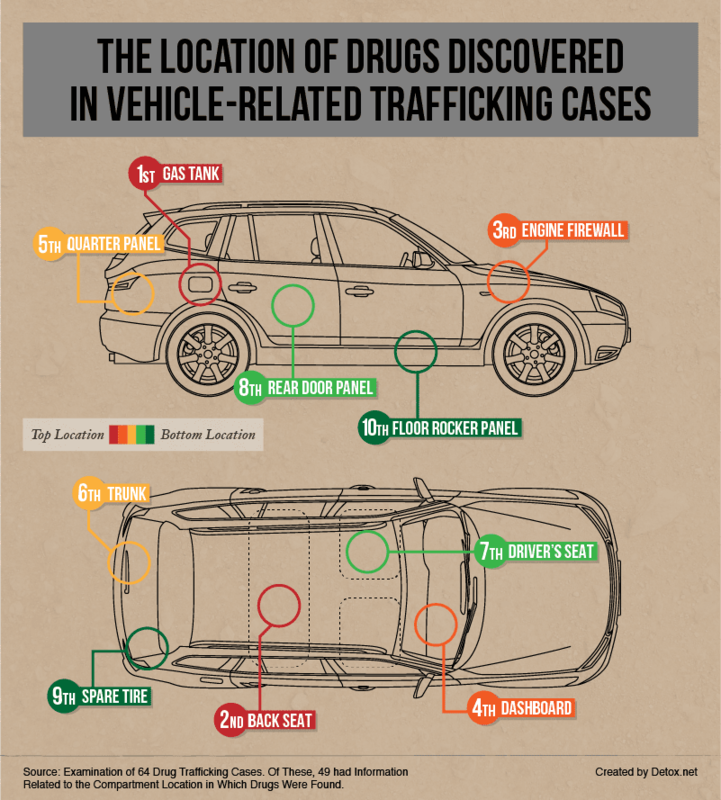 Our research shows that smugglers will conceal drugs within factory-created open spaces, such as in quarter panels, engine firewalls, and the dashboard. However, the same court documents we researched showed that some smugglers create false or hidden compartments to conceal drugs. Cartels have even used unaccompanied children as well as clone vehicles to distract and mislead border patrol to get larger shipments of drugs smuggled across the border. People attempt to cross the border from Mexico for a number of reasons – with the vast majority seeking asylum, though some are involved (voluntarily or through coercion) in the trafficking of drugs. In any case, it can be a dangerous trip made more so with the use of body packing to avoid detection. 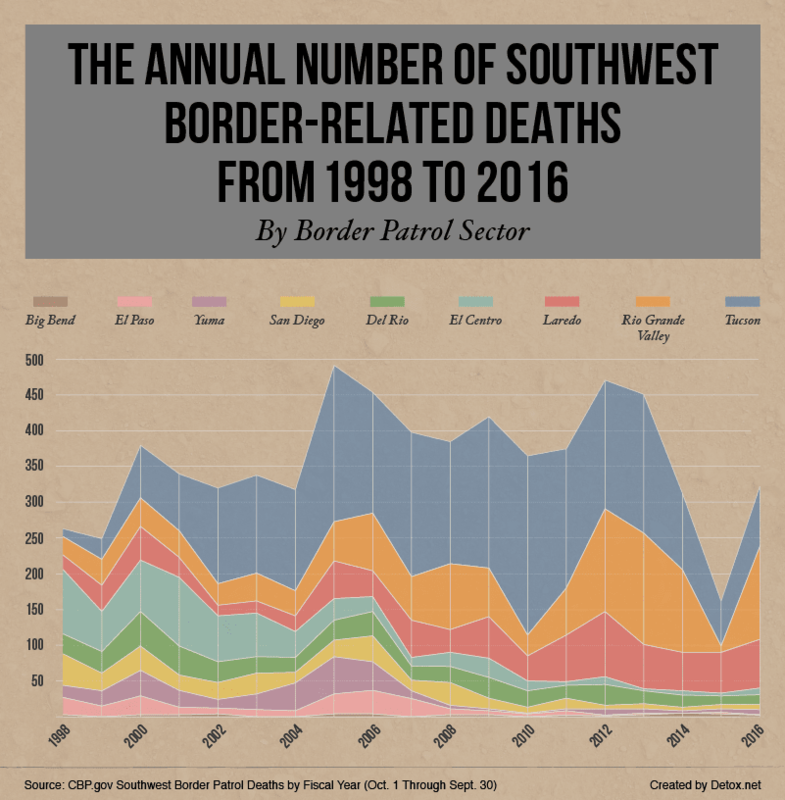 Data from the U.S. Border Patrol show total border-related deaths spanning a 20-year period, including migrants attempting to cross who succumbed to environmental conditions including dehydration, injury, and other non-trafficking-related incidents. While the data reviewed isn’t specific to just drug trafficking-related deaths, it does paint a picture of the lengths traffickers will go to in order to move drugs across borders. 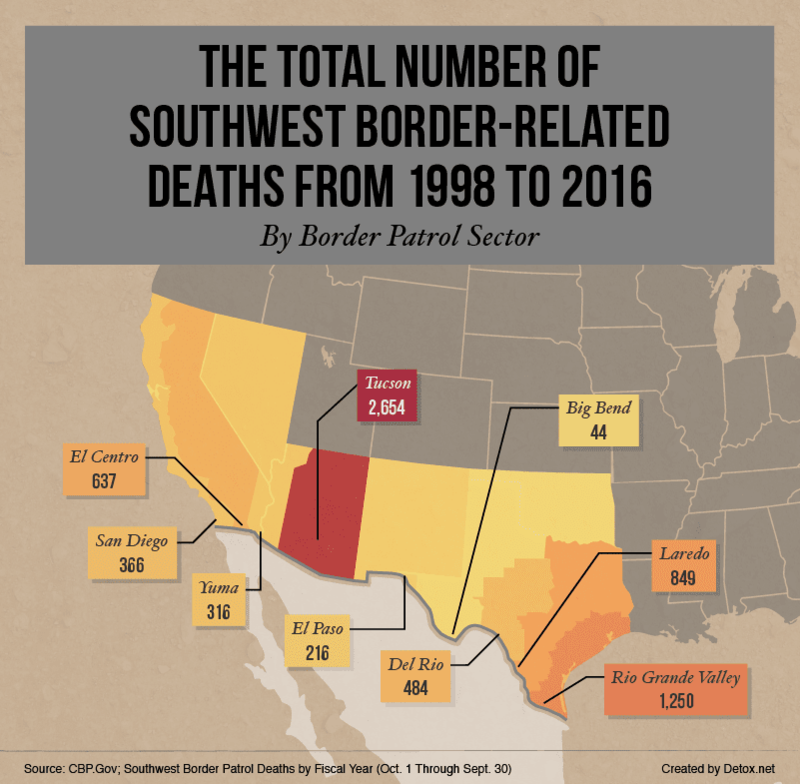 Areas with the most opportunity to cross, despite being dangerous, are more frequently used including southeast Texas, California, and Arizona with the highest volume of deaths related to border crossing. While the Rio Grande Valley in Texas has the second largest number of border-related deaths, these deaths may not necessarily be related to drugs. The Rio Grande Valley is a popular crossing point for immigrants given the expansive land that makes it difficult for border agents to patrol. Unfortunately, high heat indexes and a lack of water (or much else) make it a dangerous place to cross. It regularly claims the lives of immigrants attempting to enter the country illegally. While Arizona has seen a 65 percent decline in border apprehension and deaths – which the White House has attributed to political policies and proposals such as the border wall and changes in immigration law – 2016 was still a tough year in border-related deaths per our analysis. One key point of consideration is the spike in deaths seen after 2001 relating to the terror attacks on 9/11. The fear of terrorism brought extensive hiring of border patrol agents, and additional walls were built at key crossing points into the U.S. This forced immigrants into more remote locations of the desert, putting them in a position to succumb to heat and other elements, thus increasing border-related deaths a great deal in subsequent years. In the graph, it’s clear the number of seizures is decreasing along with the total weight of most illicit substances. This could indicate smugglers and cartels are attempting to move smaller amounts in the hopes of going undetected. Unfortunately, the weight of heroin and methamphetamine per seizure rose from 2012 to 2016. This data is unsettling given the dangers of illicit drug use, especially the harmful nature of heroin and meth. Between border seizures and the legalization of marijuana in some areas of the U.S., the cartels are turning toward heroin and meth to keep their trade alive. There are significant risks to heroin use, and continued drug trafficking into the U.S. has led to a growing number of overdoses among American citizens – even children. Today, overdoses are one of the leading causes of injury and death, even beyond car accidents and death by firearm. The use and misuse of illicit drugs take a significant toll on our youth and costs the lives of hundreds of thousands of Americans. However, if trends continue, we may see more of a decline in border-related deaths. We used PACER (Public Access to Court Electronic Records) to retrieve case documents for 166 individual court cases. Cases were identified through Westlaw to be related to “drug mules” or drug trafficking charges. Of these cases, 64 were identified as involving criminal drug trafficking charges. Of all cases, 51 had information detailing how drugs were transported. Of these 51 cases, 36 had information related to the type of vehicle used to transport drugs.